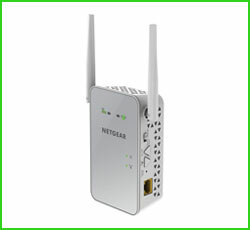 The NETGEAR AC1200 EX6150 is one of the best solutions to extend the WiFi signal in buildings with wireless dead spots. It supports both the new 802.11ac protocol working in the 5GHz range and the old 2.4GHz one. This makes it suitable for virtually any wireless setup, no matter how outdated. The unit plugs directly into the power socket. The green LED light indicates the router is within proper range, while the red one shows that it is outside this range. You can easily setup the router by pressing the WPS button. Most modern routers have this button. If yours doesn’t, you can still enjoy a seamless setup by using the proprietary NETGEAR setup app or by logging in manually in your favorite browser. The EX6150 doubles as a WiFi Access Point. An Ethernet cable is all that you need to enable all of your wireless devices in the house to connect via WiFi. The EX6150 delivers speeds up to 1200Mbps. However the transfer speed will depend on setup-specific parameters such as the thickness of the walls, the distance, and the number of signals that are in the air. Some users were able to set this unit up about 65 ft away and managed to get 90Mbps at a quick speed test. This is the perfect device to extend the range of your WiFi network to cover a dead spot in your house or on your porch, or to amplify a weak signal. If you have annoying dead spots in your house, the NETGEAR AC1200 EX6150 seems to be a relatively inexpensive and effective solution. Keep in mind, though, that you shouldn’t expect to see the same tremendous speed you get when you connect directly to your router.